Pearl Jam used their Twitter feed to drop news about taking over KISW this Tuesday, October 13th starting at Noon. 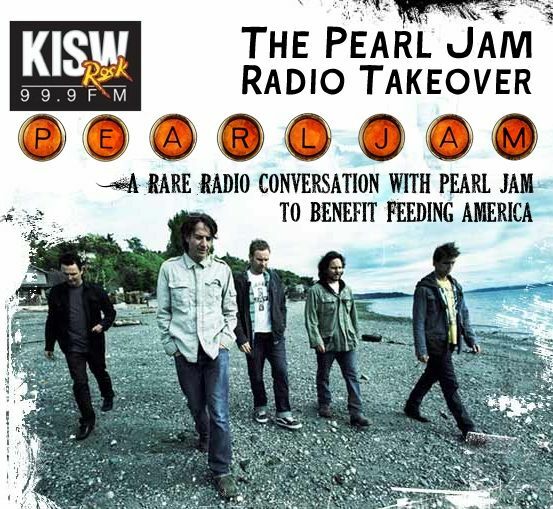 From listening to the trailer posted on KISW's site, it appears as though "takeover" means KISW will be playing a lot of Pearl Jam themed program, NOT that the members of Pearl Jam will actually be doing anything. But ... I could be wrong, and it's probably worth tuning in anyhow. Never before have Pearl Jam fans had such an up-close, in-depth look at what goes on behind the scenes when Ed, Jeff, Matt, Mike and Stone are in the studio and on the road. Listen October 13th at noon and hear songs from the new Pearl Jam album, "Backspacer," and exclusive live material from Pearl Jam's summer tour last year. Plus, we'll take an inside look at the writing of the new songs on "Backspacer" and the making of the new album itself.